Ancient Egyptian religion was a complex system of polytheistic beliefs and rituals which were an integral part of ancient Egyptian society. It centered on the Egyptians' interaction with many deities who were believed to be present in, and in control of, the forces and elements of nature. 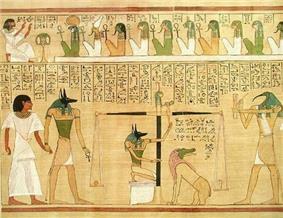 The practices of Egyptian religion were efforts to provide for the gods and gain their favor. Formal religious practice centered on the pharaoh, the king of Egypt. Although a human, the Pharaoh was believed to be descended from the gods. He acted as the intermediary between his people and the gods, and was obligated to sustain the gods through rituals and offerings so that they could maintain order in the universe. 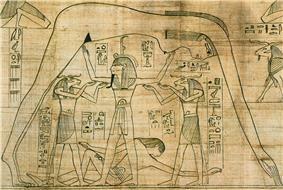 The state dedicated enormous resources to Egyptian rituals and to the construction of the temples. The religion had its roots in Egypt's prehistory and lasted for more than 3,000 years. The details of religious belief changed over time as the importance of particular gods rose and declined, and their intricate relationships shifted. At various times, certain gods became preeminent over the others, including the sun god Ra, the creator god Amun, and the mother goddess Isis. For a brief period, in the aberrant theology promulgated by the Pharaoh Akhenaten, a single god, the Aten, replaced the traditional pantheon. Ancient Egyptian religion and mythology left behind many writings and monuments, along with significant influences on ancient and modern cultures. The beliefs and rituals now referred to as "Ancient Egyptian religion" were integral within every aspect of Egyptian culture. Their language possessed no single term corresponding to the modern European concept of religion. Ancient Egyptian religion was not a monolithic institution, but consisted of a vast and varying set of beliefs and practices, linked by their common focus on the interaction between the world of humans and the world of the divine. The characteristics of the gods who populated the divine realm were inextricably linked to the Egyptians' understanding of the properties of the world in which they lived. The relationships between deities could also be expressed in the process of syncretism, in which two or more different gods were linked to form a composite deity. This process was a recognition of the presence of one god "in" another when the second god took on a role belonging to the first. These links between deities were fluid, and did not represent the permanent merging of two gods into one; therefore, some gods could develop multiple syncretic connections. 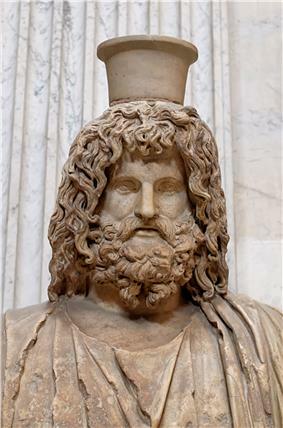 Sometimes syncretism combined deities with very similar characteristics. At other times it joined gods with very different natures, as when Amun, the god of hidden power, was linked with Ra, the god of the sun. The resulting god, Amun-Ra, thus united the power that lay behind all things with the greatest and most visible force in nature. 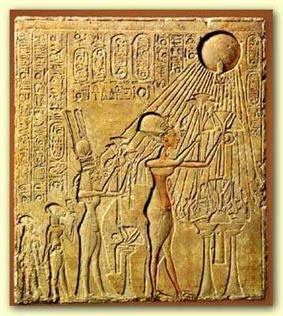 The Egyptians did have an aberrant period of some form of monotheism during the New Kingdom, in which the pharaoh Akhenaten abolished the official worship of other gods in favor of the sun-disk Aten. This is often seen as the first instance of true monotheism in history, although the details of Atenist theology are still unclear. 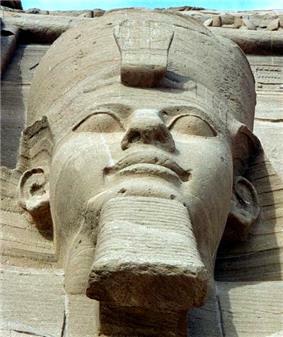 The exclusion of all but one god was a radical departure from Egyptian tradition and some see Akhenaten as a practitioner of monolatry rather than monotheism, as he did not actively deny the existence of other gods; he simply refrained from worshipping any but the Aten. Under Akhenaten's successors Egypt reverted to its traditional religion, and Akhenaten himself came to be reviled as a heretic. The Egyptian conception of the universe centered on Ma'at, a word that encompasses several concepts in English, including "truth," "justice," and "order." It was the fixed, eternal order of the universe, both in the cosmos and in human society. It had existed since the creation of the world, and without it the world would lose its cohesion. In Egyptian belief, Ma'at was constantly under threat from the forces of disorder, so all of society was required to maintain it. On the human level this meant that all members of society should cooperate and coexist; on the cosmic level it meant that all of the forces of nature—the gods—should continue to function in balance. This latter goal was central to Egyptian religion. The Egyptians sought to maintain Ma'at in the cosmos by sustaining the gods through offerings and by performing rituals which staved off disorder and perpetuated the cycles of nature. Originally, however, the Egyptians believed that only the pharaoh had a ba, and only he could become one with the gods; dead commoners passed into a dark, bleak realm that represented the opposite of life. The nobles received tombs and the resources for their upkeep as gifts from the king, and their ability to enter the afterlife was believed to be dependent on these royal favors. 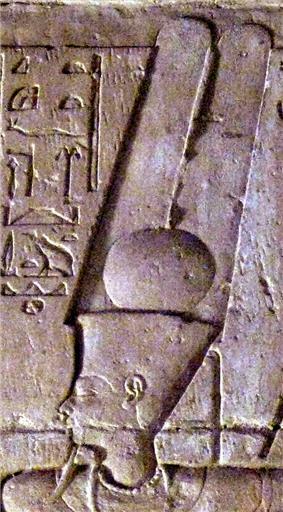 In early times the deceased pharaoh was believed to ascend to the sky and dwell among the stars. Over the course of the Old Kingdom (c. 2686–2181 BC), however, he came to be more closely associated with the daily rebirth of the sun god Ra and with the underworld ruler Osiris as those deities grew more important. During the late Old Kingdom and the First Intermediate Period (c. 2181–2055 BC), the Egyptians gradually came to believe that possession of a ba and the possibility of a paradisiacal afterlife extended to everyone. 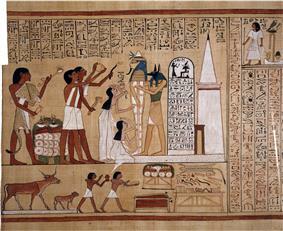 In the fully developed afterlife beliefs of the New Kingdom, the soul had to avoid a variety of supernatural dangers in the Duat, before undergoing a final judgment known as the "Weighing of the Heart". In this judgment, the gods compared the actions of the deceased while alive (symbolized by the heart) to Ma'at, to determine whether he or she had behaved in accordance with Ma'at. If the deceased was judged worthy, his or her ka and ba were united into an akh. Several beliefs coexisted about the akh's destination. Often the dead were said to dwell in the realm of Osiris, a lush and pleasant land in the underworld. 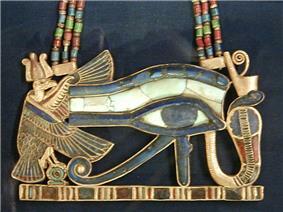 The solar vision of the afterlife, in which the deceased soul traveled with Ra on his daily journey, was still primarily associated with royalty, but could extend to other people as well. Over the course of the Middle and New Kingdoms, the notion that the akh could also travel in the world of the living, and to some degree magically affect events there, became increasingly prevalent. Among the most significant and extensively preserved Egyptian writings are funerary texts designed to ensure that deceased souls reached a pleasant afterlife. The earliest of these are the Pyramid Texts. They are a loose collection of hundreds of spells inscribed on the walls of royal pyramids during the Old Kingdom, intended to magically provide the king with the means to join the company of the gods in the afterlife. The spells appear in differing arrangements and combinations, and few of them appear in all of the pyramids. The word "magic" is used to translate the Egyptian term heka, which meant, as James P. Allen puts it, "the ability to make things happen by indirect means". Heka was believed to be a natural phenomenon, the force which was used to create the universe and which the gods employed to work their will. Humans could also use it, however, and magical practices were closely intertwined with religion. In fact, even the regular rituals performed in temples were counted as magic. Individuals also frequently employed magical techniques for personal purposes. Although these ends could be harmful to other people, no form of magic was considered inimical in itself. Instead, magic was seen primarily as a way for humans to prevent or overcome negative events. 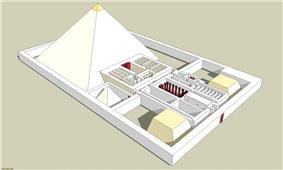 The first Egyptian tombs were mastabas, rectangular brick structures where kings and nobles were entombed. Each of them contained a subterranean burial chamber and a separate, aboveground chapel for mortuary rituals. In the Old Kingdom the mastaba developed into the pyramid, which symbolized the primeval mound of Egyptian myth. Pyramids were reserved for royalty, and were accompanied by large mortuary temples sitting at their base. Middle Kingdom pharaohs continued to build pyramids, but the popularity of mastabas waned. Increasingly, commoners with sufficient means were buried in rock-cut tombs with separate mortuary chapels nearby, an approach which was less vulnerable to tomb robbery. By the beginning of the New Kingdom even the pharaohs were buried in such tombs, and they continued to be used until the decline of the religion itself. The beginnings of Egyptian religion extend into prehistory, and evidence for them comes only from the sparse and ambiguous archaeological record. Careful burials during the Predynastic period imply that the people of this time believed in some form of an afterlife. At the same time, animals were ritually buried, a practice which may reflect the development of zoomorphic deities like those found in the later religion. The evidence is less clear for gods in human form, and this type of deity may have emerged more slowly than those in animal shape. Each region of Egypt originally had its own patron deity, but it is likely that as these small communities conquered or absorbed each other, the god of the defeated area was either incorporated into the other god's mythology or entirely subsumed by it. This resulted in a complex pantheon in which some deities remained only locally important while others developed more universal significance. As the time changed and the shifting of the empires changed like the middle kingdom, new kingdom, and old kingdom, usually the religion followed stayed within the border of that territory. Egyptian religion produced the temples and tombs which are ancient Egypt's most enduring monuments, but it also influenced other cultures. In pharaonic times many of its symbols, such as the sphinx and winged solar disk, were adopted by other cultures across the Mediterranean and Near East, as were some of its deities, such as Bes. Some of these connections are difficult to trace. The Greek concept of Elysium may have derived from the Egyptian vision of the afterlife. In late antiquity, the Christian conception of Hell was most likely influenced by some of the imagery of the Duat. Biblical accounts of Jesus and Mary may have been influenced by that of Isis and Orisis. Egyptian beliefs also influenced or gave rise to several esoteric belief systems developed by Greeks and Romans, who considered Egypt as a source of mystic wisdom. Hermeticism, for instance, derived from the tradition of secret magical knowledge associated with Thoth. Traces of ancient beliefs remained in Egyptian folk traditions into modern times, but its influence on modern societies greatly increased with the French Campaign in Egypt and Syria in 1798 and their seeing the monuments and images. As a result of it, Westerners began to study Egyptian beliefs firsthand, and Egyptian religious motifs were adopted into Western art. Egyptian religion has since had a significant influence in popular culture. Due to continued interest in Egyptian belief, in the late 20th century, several new religious groups have formed based on different reconstructions of ancient Egyptian religion. ^ Wilkinson 2003, pp. 28, 187–89. ^ Wilkinson 2003, pp. 36–39. ^ Assmann 2001, pp. 10–11. ^ Najovits, Simson (2003). Egypt, trunk of the tree 2. Algora. pp. 131–44. ^ Van Dijk, Jacobus, “The Amarna Period and the Later New Kingdom", in Shaw 2000, pp. 311–12. ^ a b c Callender, Gae, "The Middle Kingdom", in Shaw 2000, pp. 180–81. ^ Assmann 2005, pp. 121–28, 389–90. ^ David 2002, p. 79. ^ a b Assmann 2005, pp. 389–91. ^ Pinch 1994, p. 18. ^ a b Foster, John L., "Lyric", in Redford 2001, vol. II, pp. 312–17. ^ Malek, Jaromir, "The Old Kingdom", in Shaw 2000, pp. 92–93, 108–9. ^ Malek in Shaw 2000, p. 113. ^ Seidlmayer, Stephen, "The First Intermediate Period". in Shaw 2000, p. 124. ^ David 2002, pp. 154–56. ^ David & 2002 154. ^ Steven Strong, Evan Strong (2008). Mary Magdalene's Dreaming: A Comparison of Aboriginal Wisdom and Gnostic Scripture. University Press of America. p. 5. ——— (2005) . Death and Salvation in Ancient Egypt. Lorton, David transl. Cornell University Press. David, Rosalie (2002). Religion and Magic in Ancient Egypt. Penguin. Dunand, Françoise; Zivie-Coche, Christiane (2005). Gods and Men in Egypt: 3000 BCE to 395 CE. Lorton, David transl. Cornell University Press. Fleming, Fergus; Lothian, Alan (1997). 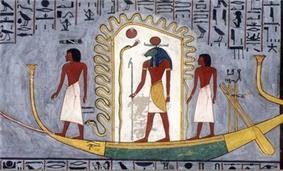 The Way to Eternity: Egyptian Myth. Amsterdam: Duncan Baird. Frankfurter, David (1998). Religion in Roman Egypt: Assimilation and Resistance. Princeton University Press. ——— (2001). The Secret Lore of Egypt: Its Impact on the West. Lorton, David transl. Cornell University Press. Lesko, Leonard H (1991), Ancient Egyptian Cosmogonies and Cosmology in Shafer & 1991 pp. 117–21. Quirke, Stephen; Spencer, Jeffrey (1992). The British Museum Book of Ancient Egypt. Thames & Hudson. Sadek, Ashraf Iskander (1988). Popular Religion in Egypt during the New Kingdom. Hildesheim. Shafer, Byron E, ed. (1991). Religion in Ancient Egypt: Gods, Myths, and Personal Practice. Cornell University Press. Shafer, Byron E, ed. (1997). Temples of Ancient Egypt. IB Tauris. Taylor, John (2001). Death and the Afterlife in Ancient Egypt. University of Chicago Press. Tobin, Vincent Arieh, Myths: An Overview , in Redford 2001, vol. II, pp. 464–68. Traunecker, Claude (2001) . The Gods of Egypt. Lorton, David transl. Cornell University Press. ——— (2003). The Complete Gods and Goddesses of Ancient Egypt. Thames & Hudson. Budge, EA Wallis (August 1, 1991), Egyptian Religion: Egyptian Ideas of the Future Life, Library of the Mystic Arts, Citadel, . Clarysse, Willy; Schoors, Antoon; Willems, Harco; Quaegebeur, Jan (1998), Egyptian Religion: The Last Thousand Years: Studies Dedicated to the Memory of Jan Quaegebeur, Peeters, . 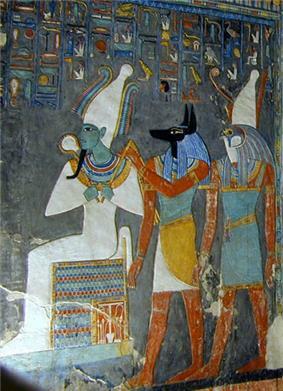 Hart, George (1997), Egyptian Myths, Legendary Past, University of Texas Press, . ——— (2003) [Kinshasa-Munich, 1986], Les cosmo-théologies philosophiques de l’Égypte Antique. Problématique, prémisses herméneutiques et problèmes majeurs, Academy of African Thought (in French) 1, Munich-Paris, sec I . ——— (2003) [Kinshasa-Munich 1995], Métaphysique Pharaonique IIIème millénaire av. J.-C., Academy of African Thought (in French) 4, Munich-Paris: C.A. Diop-Center for Egyptological Studies-INADEP, sec I . ——— (2004) [Kinshasa-Munich 1988], Le Créateur et la Création dans la pensée memphite et amarnienne. Approche synoptique du Document Philosophique de Memphis et du Grand Hymne Théologique d'Echnaton, Academy of African Thought (in French) 2, Munich-Paris, sec I .
Schulz, R; Seidel, M (1998), Egypt: The World of the Pharaohs, Cologne: Könemann, . 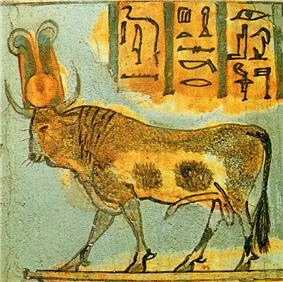 "Ideology and Belief in Ancient Egypt", Digital Egypt, .